Indian smartphone maker Micromax has launched its new entry-level smartphone Spark Go. The Micromax Spark Go device has been introduced in partnership with Flipkart. Reliance Jio customers will get the benefit of additional data if they buy this smartphone from Micromax. Spark Go is part of Google's Android Oreo (Go Edition). Google has released this edition to issue a fast OS update for entry-level smartphones. The price of Micromax Spark Go has been kept at Rs 3,999. It will be available for purchase on the online shopping website Flipkart from October 26. Due to the partnership with Reliance Jio, customers who buy this Micromax phone will get 25GB 4G data. Giving 5 recharges of Rs. 198 or Rs. 299 will get 5 GB additional data. Speaking of specifications, Micromax Spark Go has a 5 inch FWVGA display. Whose resolution is 480x854 pixels. The phone has 1GB RAM and 8 GB internal storage. The phone's storage can be expanded up to 32 GB via microSD card. 2000mAh battery is given to power the smartphone. The phone has 5 megapixel rear and 2 megapixel front sensor. Transsion Holdings's sub-brand Infinix launched its new smartphone, Hot S3X, on Thursday. Infinix Hot S3X is an upgraded variant of Infinix Hot S3X, launched last year. The phone has two rear cameras, AI selfie cameras. The smartphone will be launched at Flipkart's Big Diwali sale next month. This new phone from Infinix has been launched with 3GB RAM / 32GB storage variant at Rs 9,999. Flipkart, which will be telecast exclusively from November 1 to 5, will be sold in Big Diwali sell. The phone will be found in Ice Blue, Standton Black and Tradewinds gray color. Infinix Hot S3 X Android 8.1 runs on Oreo-based custom XOS. It has a 6.2 inch HD + (720x1500 pixels) LCD screen with an aspect ratio of 18.75: 9. The screen-to-body aspect ratio is 86 percent. The Qualcomm Snapdragon 430 processor has been given in the phone. Adreno 505 GPU, 3 GB RAM and 32 GB inbuilt storage are provided for graphics. Storages can be extended up to 128 GB via microSD card. Talking about photography, Infinix Hot S3X has 13 megapixel primery and 2 megapixel depth sensor. The camera comes with aperture F / 2.0, PDAF, HDR and dual-LED flash. A further 16 megapixel self-camera camera with aperture F / 2.0 and softlight flash is available in the phone. For connectivity, Infinix Hot S3X has been given Wi-Fi, Bluetooth 4.2, GPS, Micro-USB port (with OTG Suport) and 3.5mm headphone jacks. Smartphones include Accelerometer, Ambient Light Sensor, Electronic Compass, Fingerprint Sensor and Proximity Sensors. The phone has 4000mAh battery. The phone weighs 150 grams. Friends, both phones are good for their price. 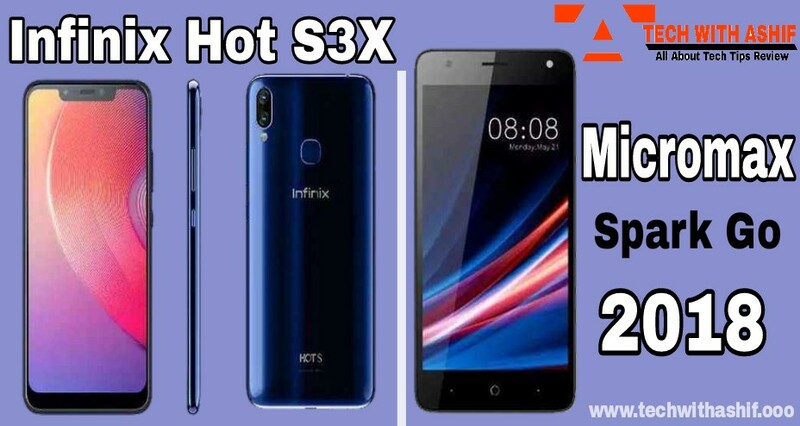 Micromax Spark Go, you can buy it as a Value for money product and Infinix Hot S3X is also good but at this price there are many options in the market. Please share in the comments about what to think about these phones.